Solving the mysteries of lameness systematically. Lameness is a reality of equine life. At one point or another, most horse owners must face the conundrum of the lame horse. Ranging from “a little off” to non-weight-bearing on one leg, lameness is one of the most common medical conditions of horses and a common cause of lost performance and training time. However, a horse can’t point to where it hurts. Often, a veterinarian can isolate the affected leg and possibly the region of the leg through visual and manipulative examination, but to determine the cause of the lameness, the location must be further pinpointed. Veterinarians use perineural anesthesia, commonly called “nerve blocks,” to isolate the painful area of the limb. Nerve blocks work by effectively interrupting the transmission of the pain signal from the affected area to the brain. When the painful area is below the region that is anesthetized, the horse no longer perceives the pain, and its gait will temporarily improve. To understand how and why veterinarians use nerve blocks, it is helpful to have a basic understanding of the anatomy of the equine limb and the actions of the anesthetic drugs. 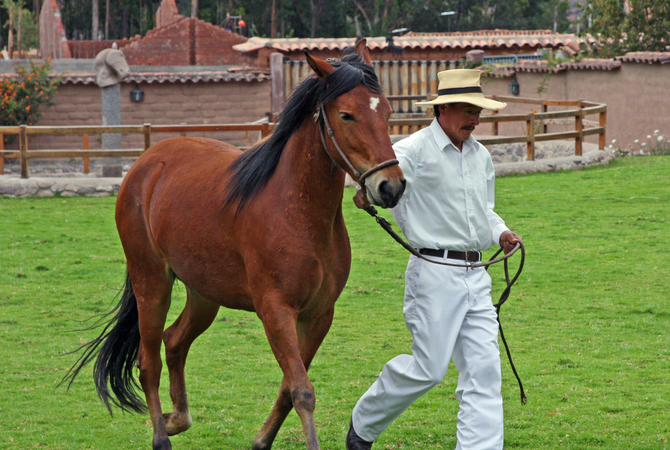 After each nerve block injection, the veterinarian observes the horse's gait. An improved gait indicates the source of pain is in the area associated with the particular block. The equine limb is composed of skin, muscle, tendon, ligament, blood vessels, nerve, bone, synovial (joint) structures, and keratin (hoof). It is a complex system relying on multiple interactions for movement and to counteract gravity. Lameness can arise from any one or more of these tissues, and it is possible for a horse to experience lameness arising from more than one source at a time. Pain sensation is conveyed from the affected area to the brain by efferent nerves. The main nerve branches in the lower limbs (front and hind) travel down the back (palmar or plantar) aspect of the leg on either side of the leg (medial and lateral). Nerve blocks are used at specific points along these nerves in order to localize pain to a region. Nerve blocks do not generally indicate the specific tissue(s) involved in the lameness, but they give the veterinarian clues as to where to focus diagnostics, such as X-rays and/or ultrasound. Lidocaine – 2% lidocaine hydrochloride. Rapidly effective, short-acting (60 minutes duration, with maximum effect at 15 minutes), irritating. Mepivacaine (Carbocaine) – 2% mepivacaine hydrochloride. Somewhat longer lasting (gait characteristics persist beyond 2 hours, though full effect is seen only for 15-60 minutes), less irritating than lidocaine. 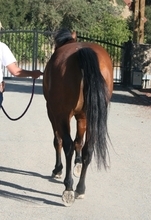 A horse may have several sources of lameness in one leg. If one affected area is distal to the block, but another area remains "unblocked," the horse may still show lameness; however, the degree and/or character of that lameness may change. Accuracy of desensitization of the nerve is generally greater in the lower limb (below the knee or hock) than in the upper limb where there is more soft tissue. Anatomy varies. Horses are individuals, and the nervous anatomy may vary from one horse to another. Aberrant nerve branches can and do exist, and these branches may not be desensitized with the block. 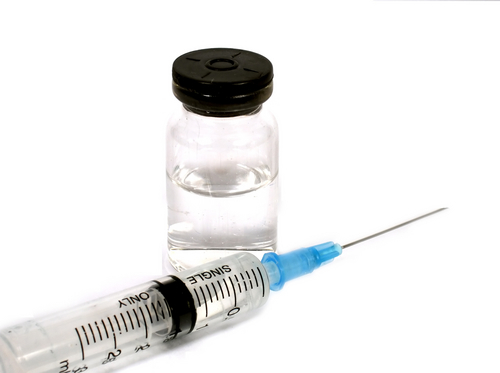 Pain emanating from a joint may not be relieved with perineural anesthesia and may require a specific injection of mepivacaine into the joint itself (joint block) for diagnosis. A horse may be lame on more than one leg. Blocking the pain on the "worse" leg may then result in a horse favoring the opposite limb. A systematic method of blocking allows the veterinarian to narrow-down the focus to a particular area of the leg or foot. With a focus established, the veterinarian will us X-ray or ultrasound to verify the cause of lameness. Because interpretation of nerve blocks is so delicate, it is critical to apply the blocks in a systematic fashion and only after a thorough lameness evaluation is performed. Simply taking the “best guess” and blocking a suspected region may prove to be of little value. Nerve blocks are typically applied beginning at the lowest (most distal) part of the limb and systematically working up the leg. Palmar (or Plantar in the hind limb) Digital (PD) Block - desensitizes the medial and lateral palmar (or plantar) nerves just above the heel bulbs at the back of the pastern. This block typically desensitizes the skin, entire sole, navicular apparatus, soft tissues of the heel, coffin joint of the forelimb, distal portion of the deep digital flexor tendon (DDFT), and some of the distal sesamoidean ligaments. May block part of the pastern joint in some horses. Pastern Ring Block - for this block, the anesthesia is injected in a ring around the pastern just above the collateral cartilages. Desensitizes all deep structures distal to the block. May not contribute much more to analysis of foot pain than a PD. Abaxial Sesamoid Block - performed at the level of the fetlock. Desensitizes the foot, pastern joint, distal aspect of long pastern, distal aspects of superficial digital flexor tendon (SDFT), and DDFT, distal sesamoidean ligaments, and annular ligaments. Low Palmar (or Plantar) (Low 4-Point) Block - performed at the distal aspect of the splint bones. Desensitizes deep structures of the fetlock and all distal structures. High Palmar (or Plantar) (High 4-Point) Block - performed below the knee or hock. Blocks deep structures in the area of the cannon. Each veterinarian will have a preferred method of applying these blocks in conjunction with a lameness examination. Because of the overlap and variation in horse limb anatomy, the veterinarian's system and experience are key to successful diagnosis of the cause of the horse's lameness. Christy Corp-Minamiji is a freelance writer and licensed veterinarian. Prior to her most recent career shift into full-time writing, she worked as a large animal (primarily equine) veterinarian for a decade, and in livestock vaccine research before that. She is a contributor to THE HORSE magazine, and has published essays on Salon.com. Christy is a 1996 graduate of the UC Davis School of Veterinary Medicine and lives in Northern California with her husband, three children, and the remnants of her sanity. In the virtual world, she can also be found at http://vet-writer.com/ and http://corp-minamiji.typepad.com.